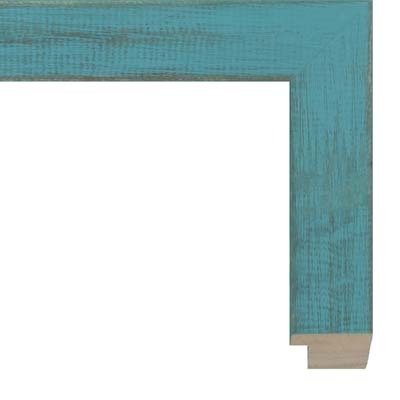 The teal color of this rustic shabby chic wood picture frame lends itself to interior design settings that feature light gray and taupe color palettes, with hints of teal color, exposed beams, and modern furniture. Additional themes may include children’s art, and New Orleans Mardi Gras flair when paired with an ornate frame as part of a stacked combination. Imagery and subject matter that may lend itself to the look of this teal wood picture frame includes contemporary abstract art, minimalist ocean scenes featuring a sea foam color palette, and colorful illustrations that feature highly stylized and bold figures. Home decor and kitchen decor are also possibilities, including inspirational word art. Matted works on paper are the most ideal pairing with this shabby chic rustic French teal wood picture frame, as the depth is less than ideal for deep items like stretched canvas. Works on paper that could be framed in this profile include giclee prints, silkscreen prints, concert posters, music and movie posters, original watercolor paintings, original fine art relief prints, drawings, acrylic paintings on paper, along with original paintings on thin canvas boards and rigid hardboard panels.